Multistar continues to expand its range of accessories for the woodturner and their latest offering is this Auto-Grip sander and polisher. It is so-called because the sanding arbor simply pushes into the copolymer body where it is automatically locked in place. There are many of these passive sanders on the market so what makes this one from Multistar different? As I have come to expect from Multistar products, the build quality is superb. The body has two no-maintenance bearings installed and the two different length arms are stainless steel. It can be set up using the short or long arm or both arms together, ensuring great flexibility on depth or angle set up. It is designed to take all the AST (Advanced Sanding Technology) arbors supplied by Hegner (UK). However, I tried other manufacturer's arbors and they also seemed to fit. There are a number of options available when buying the Auto-Grip. Firstly, you can buy just the Auto-Grip unit. You will need to make your own handle with this option, but it comes with information on how to do so. Secondly you can buy the Auto-Grip sanding kit. 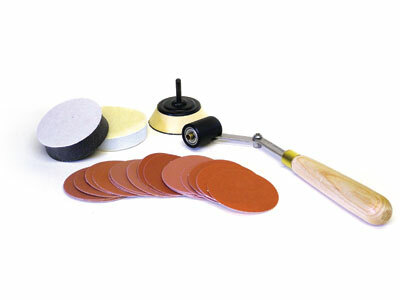 This comprises the sanding unit, an ash handle (approx 150mm (6in) long), medium density 50mm (2in) arbor with matching interface pad, polishing pad and 25 assorted grit abrasive discs. You can, of course, buy the ash handle separately if you wish. Passive sanders work by holding the arbor against the rotating work on the lathe. In common with all other sanders of this type, they are not particularly good at sanding the very centre of bowls and vases. This is because the wood is revolving too slowly in the centre to make the arbor rotate fast enough to sand effectively. I have to admit I prefer power sanding in these instances. However, they come into their own when sanding the inside of vases and particularly natural edge forms when the power sander cannot reach and where it might be unsafe to sand by hand. In these cases the Auto-Grip excels and performs very well. 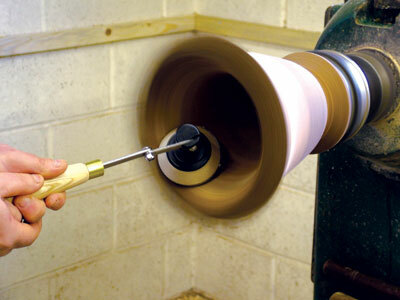 "Passive sanders work by holding the arbor against the rotating work on the lathe"